The theme of one-episode characters doesn't seem to be a sustainable model for this show. With Joe Carroll having received a good number of visitors during his stay in prison after Hardy caught him the first time, perhaps we will see every single one? Rick was interesting, but short-lived. A fireball every now and then would have livened things up a bit, but the awkward, hormone-fueled love triangle forming at the 'kidnap house' is going to get old fast. Ironically, the number one reason criminals get caught is a lack of patience, whether hiding out or simply not telling others of their crimes... but it makes for boring TV, unless emo-rage tantrums are your thing. Check out this episode's map below. There's now a snapshot included before the live map, as the live map will always have the latest version. Your browser is not able to display frames. 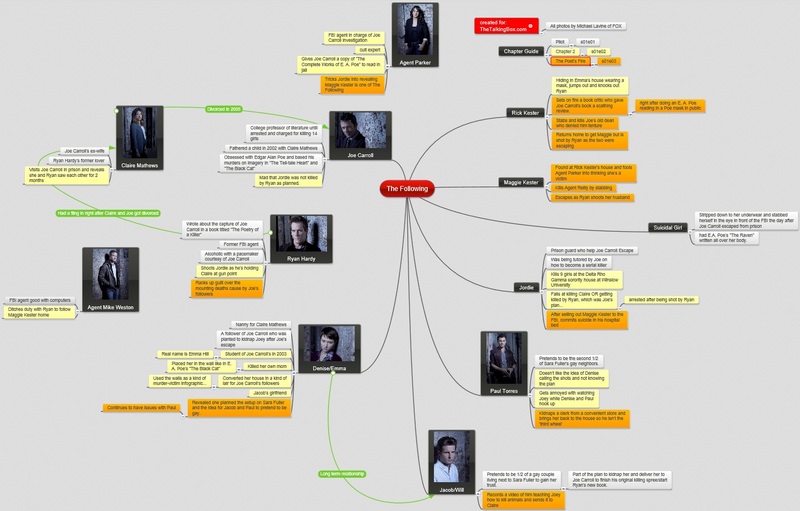 Please visit the mind map: The Following on Mind Mapping - MindMeister.